Limbaugh read from an ABC News report on the incident from Tucson affiliate KGUN9. After taking some shots at This Week-anchor and town hall host Christiane Amanpour (she’s “single-handedly destroying the show”) before moving on to “lib Democrat” Fuller, playing audio from the Democracy Now! appearance where he described the shooting as Sarah Palin, Glenn Beck, and Sharron Angle getting their “first target” (full audio can be found at the bottom of this post). Limbaugh then called Fuller a “looney toon leftist” before alleging that Jared Loughner was too because he “hated Bush.” Perhaps a fairness doctrine sensor went off in Limbaugh’s head and he felt the need to instantly counter Fuller’s claims. We had all hoped that, as horrible as the shooting had been, perhaps a new age of civility had begun. It’s hard to see that civility when people are making death threats at town hall meetings. 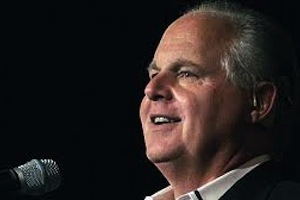 It’s even harder when you’ve got the amazing translating skills of Rush Limbaugh.